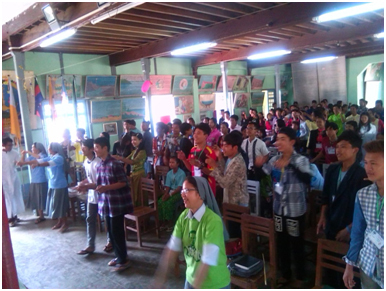 There were also joint SYM youth gathering by SDB and FMA of Myanmar from 21st to 24th April in Anisakan, Nazareth Seminary. There were 150 young people attended from different houses of Salesian boarding houses and parishes. Our young Sisters, four of them joined with the animation group of Saleisans brothers and priests. They followed up assistant time, animating action songs and games, competition among four groups for song, dance, short drama on the lives of four Salesians Saints and liturgy animation. It was a full Salesian atmosphere as Don Bosco said.